Southern Utah is known for Zion and Bryce National parks but there is so much more to do and see, especially with children. The area is filled with wonderful neighborhood parks, tons of history and historical areas, several State Parks and even ghost towns. It seems like there is a park, playground or pond in almost every area of the Southern Utah. Washington County actually wants to have a park or pond accessible to every residential area that is within walking distance and they are doing a good job of providing that. Here are just a couple of our favorite parks/playgrounds for the kids. Every visit to Southern Utah should include a visit to Pioneer Park (a.k.a. 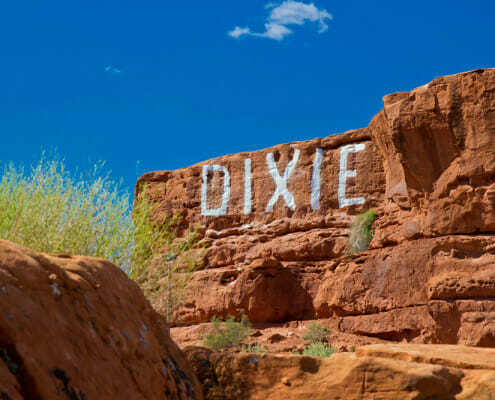 Dixie Rock). This is actually a city park that encompasses 52 acres of incredible hiking, rock climbing, slot canyons and caves. There area areas to have an afternoon picnic, BBQ or just to take a well-deserved rest scattered throughout the park. From the top of the Dixie Rock you can see the entire St. George valley, White Dome, Zion National Park and Arizona. While you are there don’t forget to hike up to Scouts Cave and try to go through the “slot canyon”. Both very popular places in the park. Right next to the Dixie Rock is one of the newest parks in Southern Utah is Red Hills Desert Garden. This is the first desert conservation garden the state of Utah. 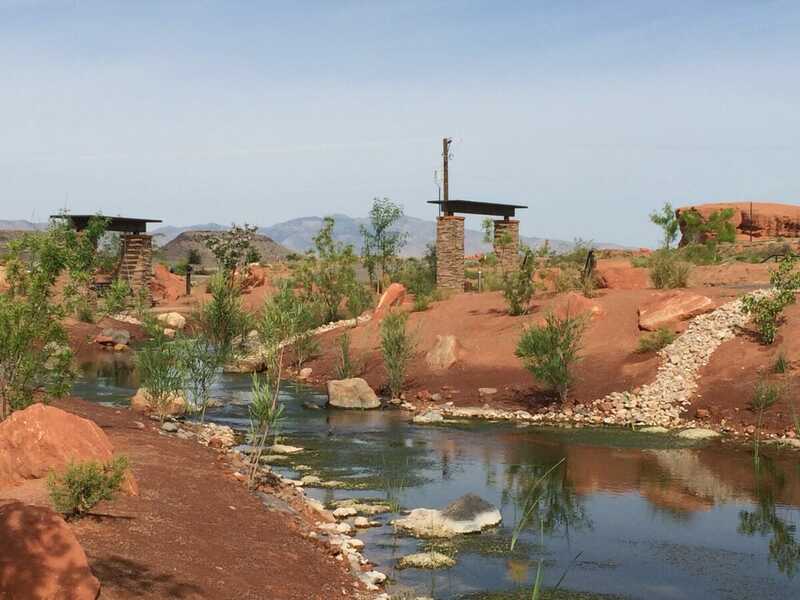 The park includes a man-made stream with water pumped directly from the Virgin River with 6 native fish species as well as over 170 species of drought tolerant plants. There is a replica of a slot canyon that towers well over 7 feet in the air. While walking around in the slot canyon you will find a fantastic area where there are acrylic windows placed in the faux rock. These windows allow you to get a peak at the aquatic life living in the river. Parts of the river are made to be crossed because you will find huge rock stepping stones to navigate over to get to the other side. There is plenty of seating scattered throughout the park as well. Just south of the Dixie Rock is the Town Square with a splash pad, lazy river, a vintage carousel and the Children’s Museum. This is a truly wonderful town square and park. The main attraction is the lazy river and the splash pad. The man-made river meanders through out the greater portion of the park. There is a rock waterfall on the north end of the river that flows into very shallow water where the kids can bet their feet wet but still be safe. There are also large sitting rocks in the middle of the river to relax on. You can’t miss the splash pad for great summer fun. This is the largest splash pad in Southern Utah and is usually filled with kids cooling off. 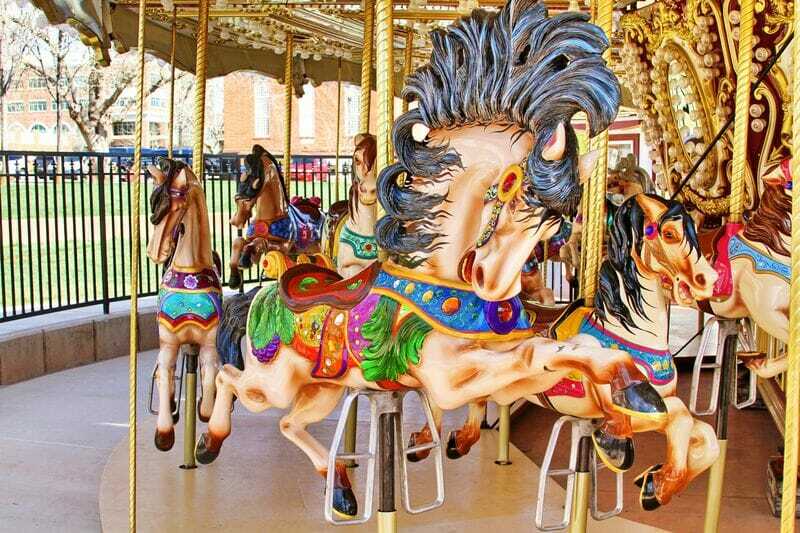 To the west side of the park is the Vintage Carousel where people of all ages can go for a spin on their favorite horse or in a carriage seat. There is ample seating, shade and picnic areas, bathrooms and huge grass areas throughout the Town Square as well. Just next door to the town square is the Children’s Museum. The museum is fairly new and a favorite in the community. It is free for all children to enter and explore. The museum encompasses 3 floors and 10,000 square feet. Your children will be able to explore everything from prehistoric animals, milking “cows”, pretending to be a knight in a castle, a mechanic working on cars and so much more. They have a sports room, science, music, art and theater exhibits as well as an airport where every child can be the pilot! 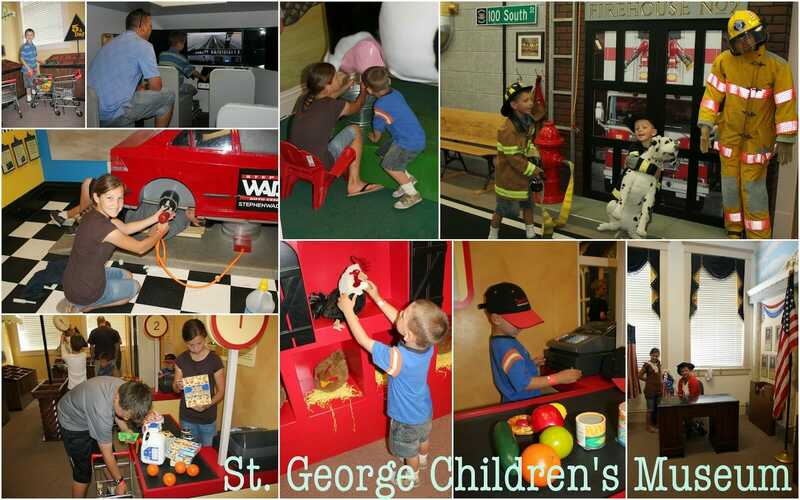 The Children’s Museum also has special exhibits throughout the year and is a favorite place for most of the local children to be free and creative. 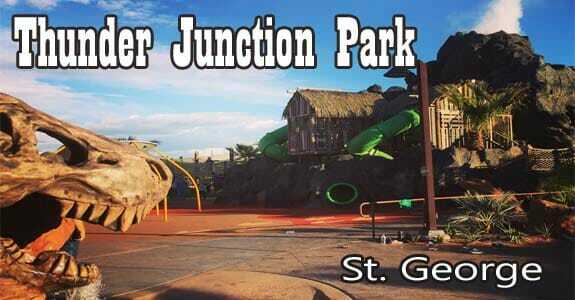 The newest park on the south west side of St. George is Thunder Junction. Thunder Junction is the only all abilities park created for children in Southern Utah. Thunder Junction features a volcano pavilion for parties, lunch, etc. If you use the BBQ grill, then the volcano actually starts smoking to simulate an eruption! This prehistoric themed city park has everything from splash pads to water features to a vast amount of playground equipment. Everything in the park has been made so that a handicapped child can still have just as much fun as anyone else. There are handicapped accessible ziplines, swings, water features as well as a train ride that circles the park and crosses the park to give everyone a fun scenic tour of the park. There is a massive dinosaur with a double slide built in the tail and a Tyrannosaurus Rex skull that sprays water out of its mouth. Thunder Junction is truly a unique park for everyone of all ages. The Rosenbruch Wildlife Museum occupies more than 35,000 sq. feet where visitors can see over 300 different species of animals found throughout the world all displayed in their natural habitat. Different parts of the world make up the displays. There is the mountains of Asia, the plains of Africa and the forests of North America. 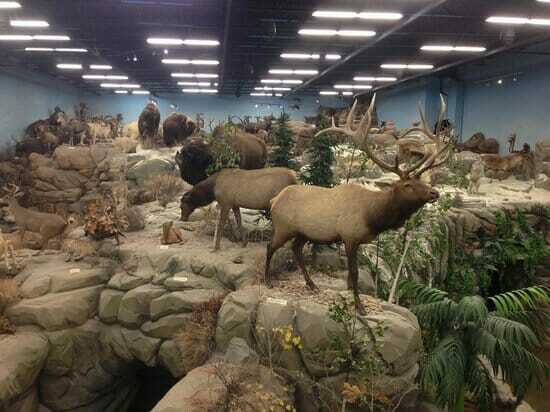 One of the main highlight of the museum is the 2-story mountain. The mountain has waterfalls and speakers that give the sounds of the animals and even a periodic thunder and lightening storm can be heard. You will see preserved animals such as mountain lions, elk, moose, deer, bighorn sheep, buffalo, crocodiles, giraffes and even a snarling cheetah as well as a vast variety of birds. There are also 100’s of insects and a wonderful butterfly collection. There is also a large kid’s room that has a full-size tree house, reading nooks, climbing area, a camping play area and a large variety of animal pelts, fur and horns that the children can touch and explore. Just outside of the museum is one of the best information and gift shops in the area. The National parks are a must see but don’t forget about visiting the local parks as well.